'Duur uw uur' and 'Beidt uw tijd' : what do these words on the tower of the Beurs van Berlage mean? 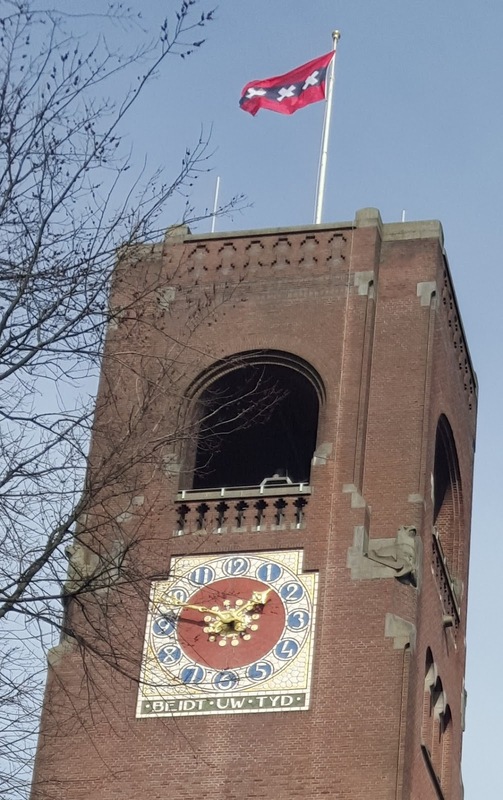 One of the many questions we get asked about the history of the Beurs van Berlage, is the meaning and significance of the words underneath the clock of the bell tower. and we can already guess that the words contain some sort of message to the spectator. Yet, as this is the well-designed Berlage Exchange Building, there may be more to it, so let's explore this a bit further. 2- a logical utopian perspective: money, trade and classes would in the future fully disappear. 2- the use as a public building in the far future (when the utopian society had arrived). Zij die geloven, haasten niet. Te rechter uur, den tijd ten spijt. Sta vast als ik en duur uw uur. Houdt hier geen stand, heeft hier geen duur. The first part of this poem is about the part of the Tower that is looking towards the city, with the wording: bide your time. 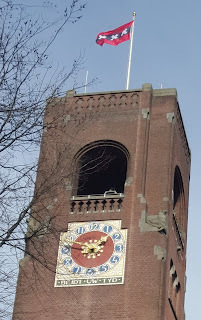 The second part is about the side of the tower that faces Amsterdam Central Station: the place where all visitors enter Amsterdam. Stand firm, just like me and as long as it (your hour) takes. Will not last, will not endure here. Taking the poem literally, we can see that the clock warns the cities inhabitants not to rush things but to rest assured that good things will come at their own time. So it's better to wait for the right time than to rush it. It could be viewed as a call to relax, to chill. Things will turn out fine in the end. 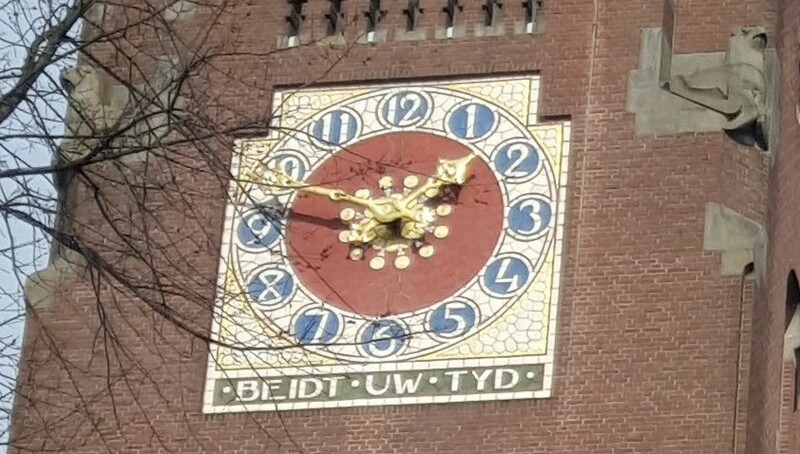 To the strangers, the clock says: if you wish to make it here in Amsterdam, make sure to rely on your talents and energy and persevere in your efforts. You won't make it here, unless you keep on pursuing your goals. The beauty of poetry is of course that all oother kinds of explanations of the poem might have been spinning around in the mind of its creator, Albert Verwey. We won't know and there's no need to. With poetry, as will all art, the creation can take up any meaning; so it's all up to us as readers. 1 - hints at the design and building process itself. There was a very long time involved from architecture contest towards the opening of the building and the first part could be viewed as the building itself saying: At last, I'm here, I'm the good and strong feat that came into existence in its own time (not the projected/expected time). Similarly the second part of the poem would reflect the fact that the building/tower is well built, strong and will last a long time. 2- is directed towards the traders at the exchanges. The poem could be viewed as a call to traders not to rush into trades but to time their transactions properly (part 1) and persevere in their business (part 2). 3- reflects the utopian perspective, mentioned earlier. In this vision, the first part of the poem would refer to the vision that over time the world will become a society without class distinctions and trade/money. At that point in time, the tower would still be there and the building could start its second life as a public / communal building. Feel free to share your insights with us via Twitter: @finerfgoed.